2007: #33 DT 6-4, 280 lbs. Sr.
2006: #33 DL 6-4, 265 lbs. Jr.
34 total tackles (18 solo, 6 for loss and 1 sack). 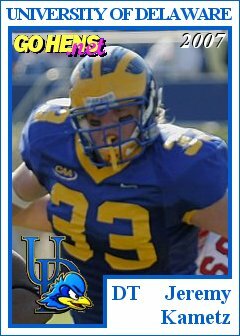 Named Blue Hen Touchdown Club Defensive Player of the Week for his performance against Villanova in which Jeremy made 2 tackles, broke up a pass and made an interception return for 5 yards. 2005: #33 DL 6-4, 250 lbs. So. 2003: #33 DL 6-4, 230 lbs. Fr. Redshirted his true Freshman year. High School: Freedom 6-4, 230 lbs. Last name pronounced "Kuh-metz"...versatile two-way player who was a standout at both tight end and linebacker at Freedom High School under head coach Jim Morgans...three-year starter who served as team captain as a senior...two-time All-conference selection at linebacker and was a two-time All-Area selection by both the Allentown Morning Call and Easton Express Times...earned pre-season All-State honors as a senior...for his career, posted 207 tackles, including 21 for loss...also added 12 sacks, intercepted five passes, and recovered seven fumbles...as a tight end on offense, caught 47 career passes for 735 yards and 10 touchdowns....son of Mr. and Mrs. John Kametz.